The Kylie brand has been helping Australians manage incontinence with confidence and comfort for many years. A lot of care and attention goes into ensuring the Kylie products live up to their well-earned reputation among healthcare professionals. Suitable for all levels of incontinence. Designed to give you the ultimate care and protection. You’ll always feel secure, dry and most important of all, very comfortable. “I have been recommending Kylie products, particularly Kylie Supreme Mac, Kylie Standard with non-slip backing and Kylie Chair pads since I first became involved in continence care more than 15 years ago. 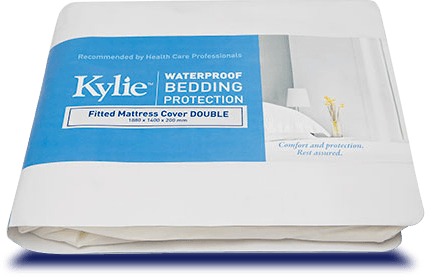 When ‘wet’ the top surface of the Kylie products remains dry and comfortable and the waterproof backing protects furniture and bedding from contamination. The Kylie brand has been helping Australian manage incontinence with confidence and comfort for many years. A lot of care and attention goes into ensuring the Kylie products live up to their well-earned reputation among healthcare professionals.